Walk In Tub | R &D Marble, Inc. When the need arises, R&D Marble has the handicap accessible bathtubs you need. In a variety of features and customizations. When personal stability and safety concerns prevent you or a loved one from using a standard shower, a walk-in tub is a perfect solution. With features like easy-grip handles, anti-slip seats, and built-in grab bars, you will never have to worry about falling again. R&D Marble offers the 26-inch and 30-inch models for your handicap accessible bathroom. Scroll down to view all of the amazing safety features and options available. Want to see a Serenity Walk In Tub up close? Get a feel for how it will look and work in your bathroom by visiting our showroom. DOUBLE WATER TIGHT SEAL: Exclusive to Serenity, the seal comes with a lifetime warranty. And, it’s the only walk-in tub on the market that has an extra double watertight door seal installed at the factory. 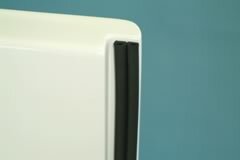 WIDE 18-1/4 INCH DOOR: The easy access door features a stainless steel piano hinge, far superior to the two hinge models, which makes getting in and out much easier. ROUNDED DOOR: A rounded edge on the bottom means you won’t have to move your feet and legs out of the way to shut the door. EASY TO GRIP HANDLE: The door is designed to be easily opened by any person, regardless of strength or physical dexterity. 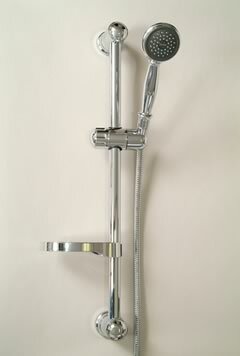 DELTA FAUCETS: All Serenity Walk In Tubs come with the Delta high volume faucets and showers. 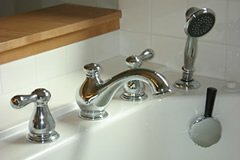 The faucet is efficient and will fill twice as fast as a standard one. Available in multiple different finishes to match your other bathroom upgrades, Delta stands out as a leader with its Lifetime Warranty and quality craftsmanship. 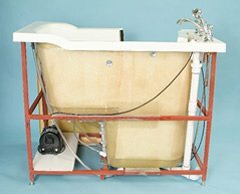 CABLE OPERATED DRAIN: Exclusive to Serenity Tubs, the cable operated drain, can be operated by anyone with little effort. You don’t need to bend down or move from your seat– simply use the easy-to-grip drain handle. Drains at 131 gallons per minute. 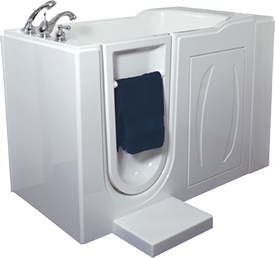 COMFORTABLE CONTOURED SEAT SIX INCH STEP-IN HEIGHT: The tub is designed with a low step-in height, which will allow easy and safe access into and out of the tub. There is an optional three-inch step available. ANTI-SLIP SEAT AND FLOOR: A molded anti-slip surface is on the floor and seat for added safety. ANTI-SLIP COMFORTABLE CONTOURED SEAT: This specially designed seat makes the bathing experience more comfortable. 16 INCH HIGH SEAT: Designed to ensure safety and comfort. 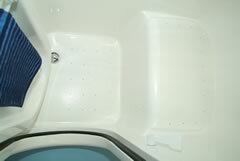 THE DEEPEST SOAKING TUB: The Serenity Walk In Tub is the deepest soaking tub available, measuring an impressive 21″ to the seat, which will allow most people to soak shoulder deep! The tub is designed for ultimate comfort and relaxation. ONE INCH STEEL FRAME: Just as your home requires a strong foundation, the steel frame is the foundation of the Serenity Walk In Tub providing quality and durability. Because of the steel frame, there is no concern with the tub twisting or becoming distorted, causing the tub to leak. The frame has completely welded joints, powder coated finish, and it’s built to last. SEVEN LEVELING LEGS: The seven leveling legs provide plenty of support for the tubs and simplify the installation. Simply twist and lock into place. EASY TO GRIP HANDLE: Designed to be easily opened by any person, regardless of strength or physical dexterity. ADJUSTABLE SHOWER SLIDE BAR: Use as a stand-up or sit-down shower with the adjustable shower slide bar. SHOWER CURTAIN, ROD, AND RINGS: These features come standard on all of our walk in tubs! BUILT IN TOWEL RACK: Convenience at your fingertips. BUILT-IN GRAB BAR: Safety and comfort are our top priorities! A built-in grab bar ensures slips and falls are a thing of the past. Want to customize your Serenity Walk In Bathtub? Simply choose which features you want and our friendly staff will find the right one for you. Give your bathroom the ultimate custom look with upgrades like other ADA accessible products, backsplashes, and trims manufactured to your specifications, along with sinks and countertops that match your tub. R&D Marble has been making residential and commercial kitchens and bathrooms beautiful for over 40 years. We’re committed to top-notch customer experience and superior attention to detail on every project. Visit our showroom in Willis, Texas or fill out the form below to get started with a free estimate for your new construction or renovation project. Questions? Call (936) 856-6342. © 2019 R & D Marble . All Rights Reserved.